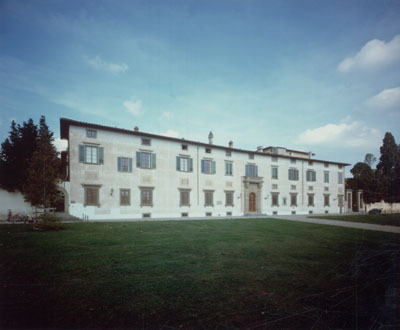 The Medicean Villa of Castello has a very plain two-storey facade: the building clearly displays renaissance shapes in its ground floor windows, in the small stony portal (that led to the ancient secret garden), and in the simple first floor windows with their stony thresholds and cornerstones. Beneath the roof there are some rectangular apertures also made of stone. The only decorative element is the portal surmounted by a balcony, which shows the many restorations made over the centuries, and the windows, some painted, some real, that open at the height of the mezzanine. Another succession of apertures, also outlined in stone, provides light to the basement. 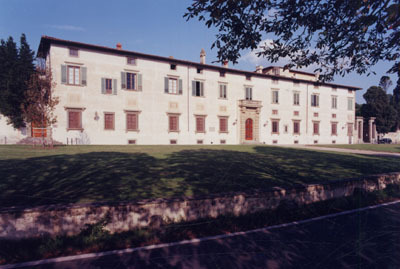 The Villa is built around a 16th Century courtyard, bordered on the shorter sides by two loggias with tuscanic pillars. Only one example remains of the Villa’s original decorative façade: an Annunciazione (i.e. Annunciation) frescoed on the lunette decorating the head of the stairs, where they lead into the courtyard. The fresco (taken down and restored in the Seventies) makes use of some compositional elements that originate from the Ghirlandaio school, widely popular at the time, and is attributable to Raffaellino del Garbo. 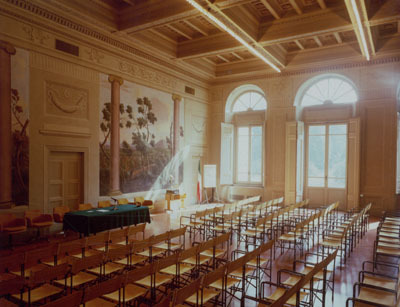 One of the two loggias leads to a huge room decorated with nineteenth-century frescoes of landscapes and views (used nowadays for conferences and public sessions of the Accademia della Crusca), to a small chapel and to another room, called The Room of Closets, with a fresco called Le Stagioni (The seasons). Like most of the villas in the Florentine countryside, the Villa of Castello is the result of a stratification of building interventions worked outwards from its ancient core, a defensive tower of the 12th Century. 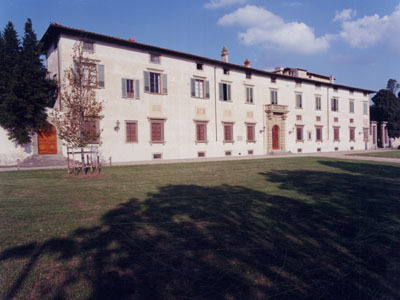 In the 14th Century the Villa was called Il Vivaio (i.e. The Pond) due to the huge fish-pools located in the large square in front of the Villa. 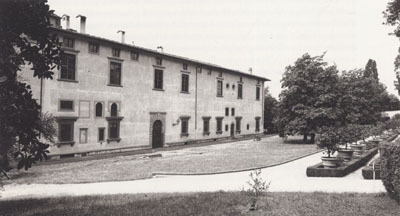 Later on the Villa became the favourite residence of the Medici family: in 1477, following the advice of Lorenzo il Magnifico, the Villa was bought by his cousins, Lorenzo and Giovanni di Pierfrancesco, from its former owners, the Stufa family, and then it was extended and converted many times until it took on the appearance of a real high-class residence. 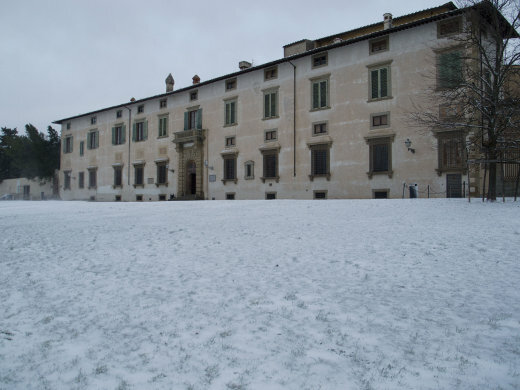 At the death of Giovanni di Pierfrancesco the Villa was inherited by his widow and his son Giovanni delle Bande Nere, who lived there with his wife Maria Salviati and his son Cosimo. 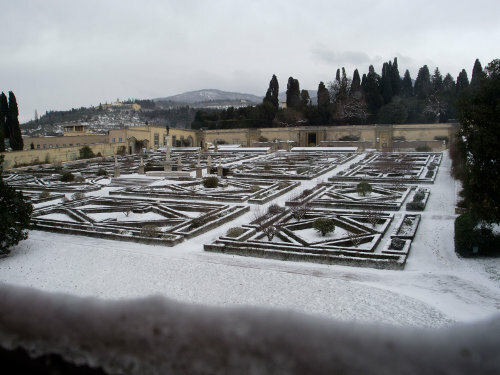 The Villa was sacked and set on fire during the siege of Florence in 1529-1530, though it did suffer less damage than other villas in the countryside surrounding the city. In 1538 Cosimo I assigned the works on the palace and the garden to Niccolò Pericoli, called Il Tribolo. Il Tribolo concentrated especially on the restoration of the garden, whilst from 1554 the management of the works was given to Vasari. In this period, precious works of arts where collected in the Villa: among them, allegorical paintings, commissioned from Pontormo (which appeared to have already been lost in the 18th century). Certainly, at least around 1540, Botticelli's two famous paintings, La nascita di Venere ("The Birth of Venus") and La Primavera ("The Spring"), nowadays kept at the Galleria degli Uffizi in Florence, were present at the Villa; it is supposed that these two extremely famous artworks (dated between 1480 and 1486) were originally designed for this Villa. The further extensions wanted by Ferdinando I de' Medici, between 1558 and 1592, were planned by Buontalenti, maybe on the earlier instructions of Il Tribolo. 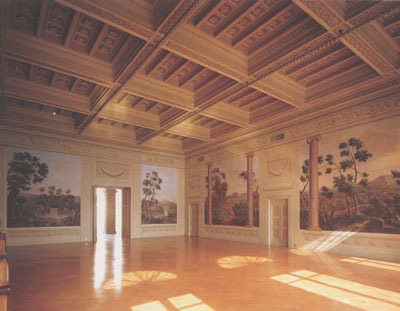 A younger son of Ferdinando, don Lorenzo, had more embellishments made on the interior of the Villa, like the fresco by Il Volterrano portraying La Vigilanza e il sonno ("Vigilance and sleep"). Later the Villa became property of the Lorena family. They considerably modified the garden and decorated several rooms of the Villa with pictorial elements. It passed then to the Savoia family, who donated it to the State in 1919. 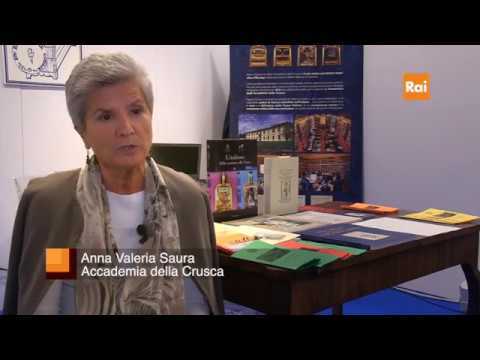 Designated to house the Accademia della Crusca in 1966, the Villa underwent a massive restoration under the direction of the Government Office of Environmental and Architectural Goods, and was then handed over to the Accademia in 1972.